Home > Scientist Of The Past Who Shaped Our Present And Future > Stepping into the light – the Story of DeWitt Bristol Brace. Stepping into the light – the Story of DeWitt Bristol Brace. Light as we know existed as long back in time as we can comprehend. Our perception about light however has changed over the years. In the 19th century, all the scientists believed that for anything to propagate there must exist a medium. So to understand the concept of propagation of light, a hypothesis, that there exists infinite ether in the universe through which the light propagated, was accepted globally until the concept of electromagnetic waves came along. Prior to Newton, Christiaan Huygens had hypothesized that light was a wave that propagated through ether, but Newton rejected this idea. This was because of their perception of light as a “longitudinal” wave did not explain some of the properties of light, like birefringence. This existence of an infinite medium (ether) must have had some consequences, and this is where our protagonist plays an important role. 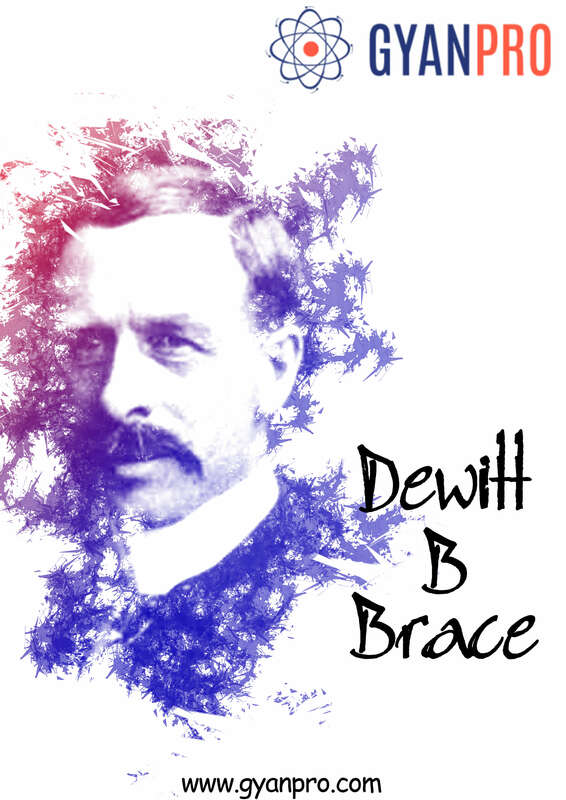 DeWitt Bristol Brace was born in Wilson, New York on January 5, 1859. He was an American physicist, known for his optical experiments, especially with regard to the relative motion of earth and the luminiferous aether (ether). He graduated from Boston College receiving a Bachelor’s (1881) and Master’s (1882) Degree. He then studied physics at John Hopkins University and in Berlin, where he received his PhD in 1885. When he arrived at University of Nebraska, Lincoln he had a limited experience in teaching and was interested in pursuing specialised scientific research. Concept of ether was a considerable topic of debate in the late 19th century, requiring the existence of an invisible and infinite medium with no physical interaction with objects. As the nature of light was explored, the physical qualities of ether became increasingly contradictory, but there were no physical theories existing then for an alternative. Brace was mainly concerned with research in Optics. He invented new types of polarizing filters, he performed experiments to determine the state of motion of earth in ether (ether drift), but the results were negative. His most notable work was to conduct an improved version of an experiment by Lord Rayleigh, demonstrating that Lorentz contraction does not lead to birefringence. To phrase it in a simpler way, the experiment was used to demonstrate, that with the contraction or change in length of a body in motion with respect to a static observer would not change the refractive indices, which resulted in varied refraction at different ends of the same object. He set up an apparatus which was 4.13 m long, 15 cm wide, and 27 cm deep, which was filled with water, and which could be rotated about a vertical or a horizontal axis. Sun rays were directed into the water through a system of mirrors and lenses, reflecting and refracting about 7 times. No sign of birefringence were yielded carrying out this experiment, but the apparatus that he set up was the initial idea behind the concept of a spectrophotometer, which is widely used currently to study the different intensities of light. Now you see me! An Invention that Shocked the World – The Story of Joseph Erlanger. “Gillette: The best a man can get.” Newton’s Rediscovery of Gravity! !